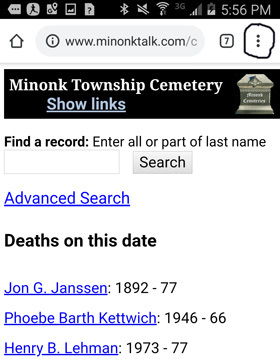 The Minonk Cemetery website format has been updated to reflect a more modern web format. Along with the new format, the website has been updated to include burial records for the St. Patrick's cemetery. The St. Patrick's burial records will contain the same type of information and be in the same format as for the Minonk Township Cemetery. Most of the records were obtained from the St. Patrick Church files. In addition, many of the records were updated from data gathered from old Minonk News-Dispatch obituaries. Obituaries from 1912 through 1962 have been added to the St. Patrick's burial records. Obituaries have also been added from 2001 through the present. We will continue to add obituaries and keep the records up to date. Also, viewers can also submit obituaries, photos and articles for a burial record on the website. The cemetery website has a word search feature that allows burial records to be selected based on a word. This can include searches on city, state, country, year, names and dates. Location of a burial site can also be shown on a map to help locate a burial. Some of the burial site locations for St. Patrick's cemetery are missing but efforts are being made to update the burial records with an accurate location. 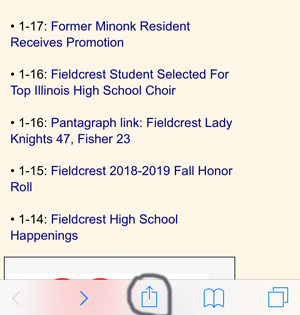 A link has been added for the St. Patrick's burial records under the Reference menu item at the top right of the MinonkTalk web page. To view the web site, click on this link. 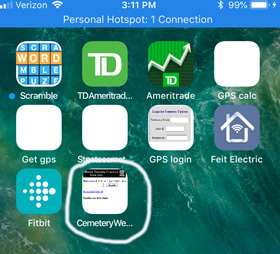 Cemetery burial data is also available on smart phones for both IOS and Android phones using the internet browser, which is Chrome for Android and Safari for IOS. 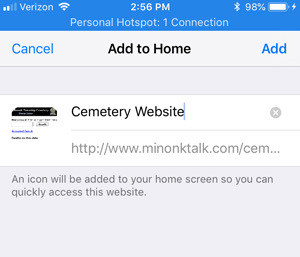 To access the Minonk Township Cemetery on your smart phone, type in this link in your browser window: "www.minonktalk/cemeterymobile/index.aspx" and for St. Patrick's Cemetery type in "www.minonktalk/cemeterymobile/stpats.aspx". Adding a website to your home screen on IOS (Apple) phone. Once you pull up the web site you should add an icon to your home screen on your phone. To do this, touch the icon at the bottom of your browser window that looks like the one circled below in the left photo. 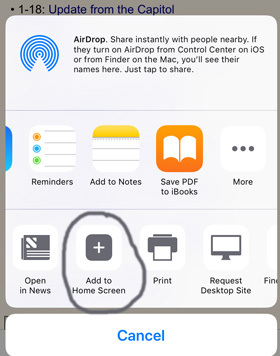 Then click on the "Add to Home Screen" icon shown circled in the photo below to the right. Next a window will be displayed that allows you to enter the name of the website as shown in the photo shown below on the left. 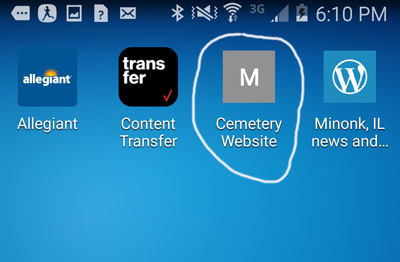 After entering the name you want, click the Add button and an icon for the cemetery website will be added to you home screen as shown in the photo below on the right. Adding a website to your home screen on Android phone. 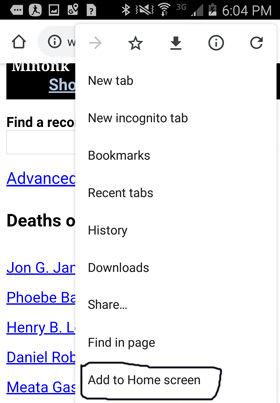 Touch the icon for the Chrome browser on your home screen. Then type in the url address of the cemetery website listed above and bring up the cemetery website. Next click on the menu icon in the upper right hand corner as shown in the circled item in the photo shown on the left below. This will then display a list of options as shown in the photo below on the right. Select the "Add to Home Screen" option. This will display an icon for the Cemetery website as shown below.